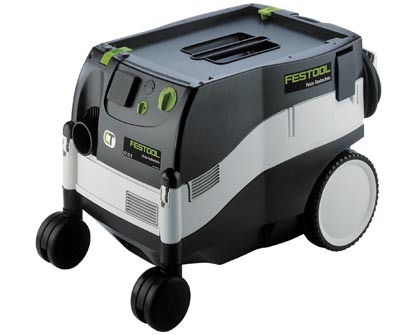 Right at the core of the Festool system is dust extraction and Festool offers a line of high performance vacuums that are every bit as well engineered as their tools. 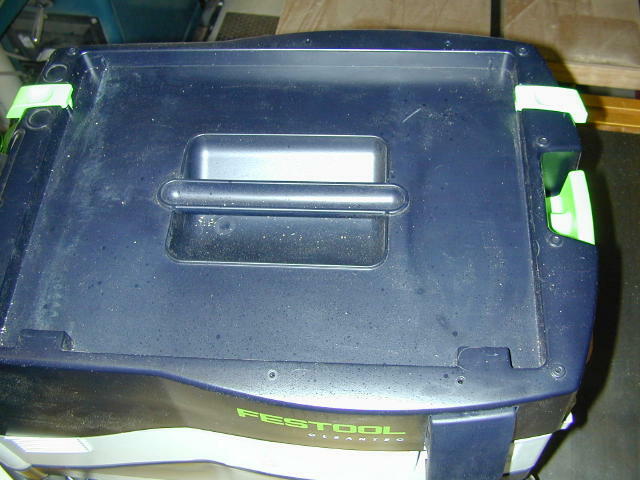 This review will walk you through the features and performance of Festool's midsized extractor, the CT 22E. 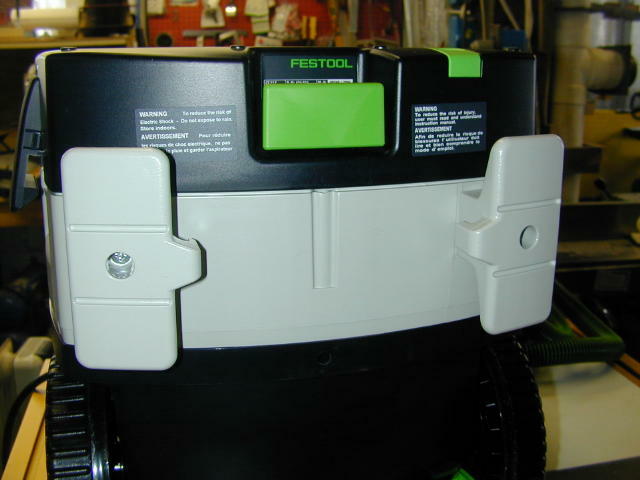 Thanks to Festool USA for providing the evaluation unit. 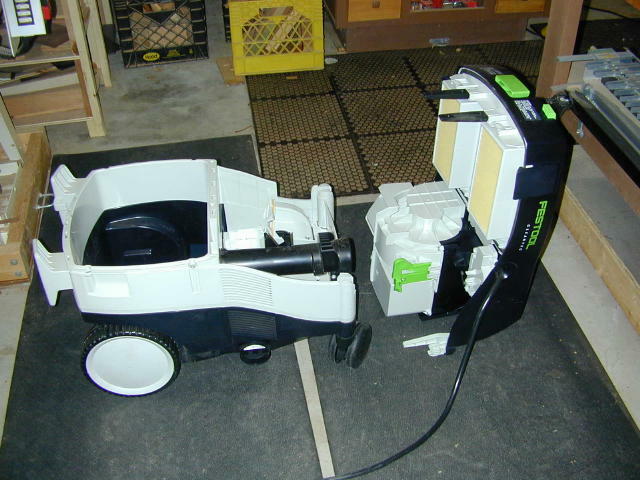 You may also want to check out my review on the Festool ES 125, ETS 150 and Rotex 125 sanders. As with all of my reviews I endeavor to provide as much detailed information as I can so that you will be able to make an intelligent purchase decision and not be surprised when you open the box. Click on any picture to enlarge it. The first impression you'll have when you get this vacuum is that you've bought a finely engineered tool....the term "shop vac" will be the last thing on your mind. The CT22E is a quiet, powerful variable speed vacuum which also has a power outlet where you can connect your sanders or saws or whatever and which will automatically power on and off the CT22E as your turn your tool on and off. The CT22E is delivered with one filter bag, the HEPA main filters and a 1" by 11.5' antistatic hose. The CT22E when used with antistatic accessories will dissipate static caused by vacuuming so that you will not get zapped...and yes, it works. In the photo at left, the CT22E has its top open exposing its innards. The only bit of assembly that has to be performed is to mount the brackets on the rear of the CT22E which are used to stow the power cord. Drop the nut into the middle hole (left), mount the bracket and screw it on. When you lift up the top to expose the dust bag, the motor comes up with it (left). 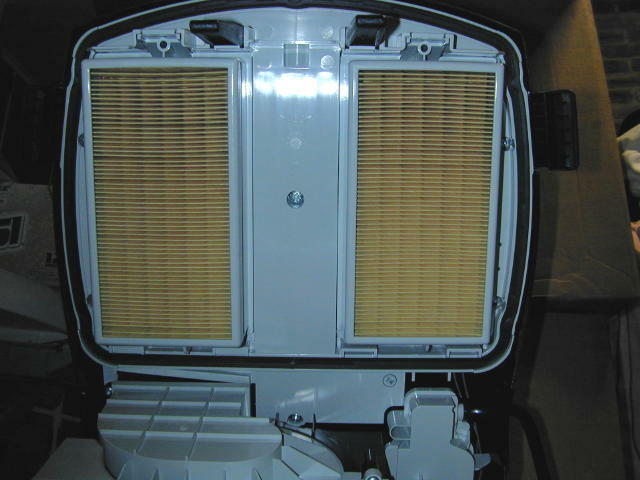 Above the motor also on the top cover of the CT22E are a pair of filters (right). On the currently shipping CT22E's these filters are HEPA. At left I've taken out one of the main filters as if to replace it. 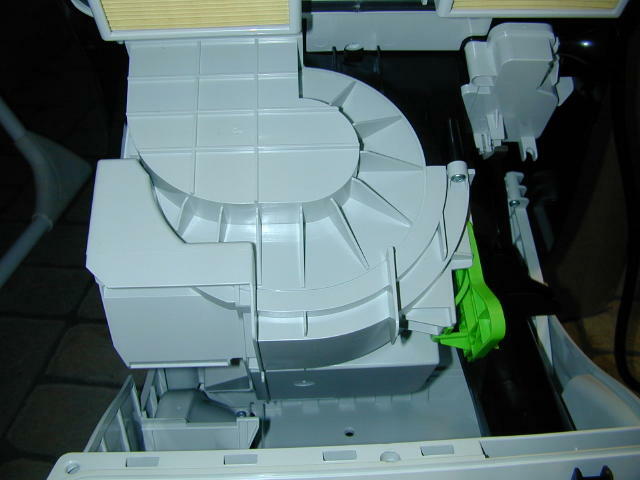 The filter separates from the CT22E cover assembly and then from its plastic enclosure. 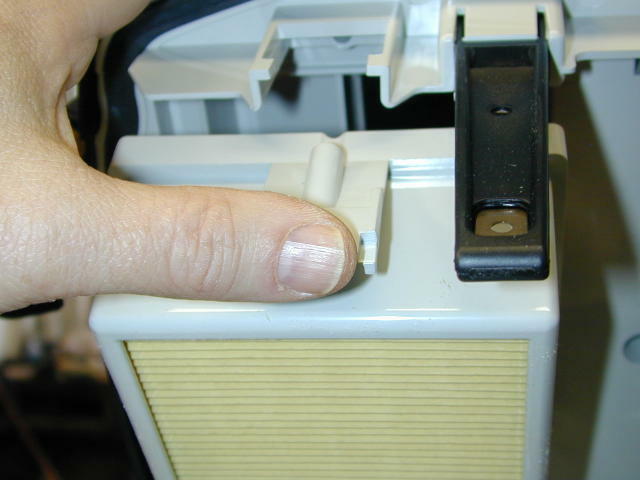 At right illustrates both removing and replacing the filter assembly by releasing a latch. 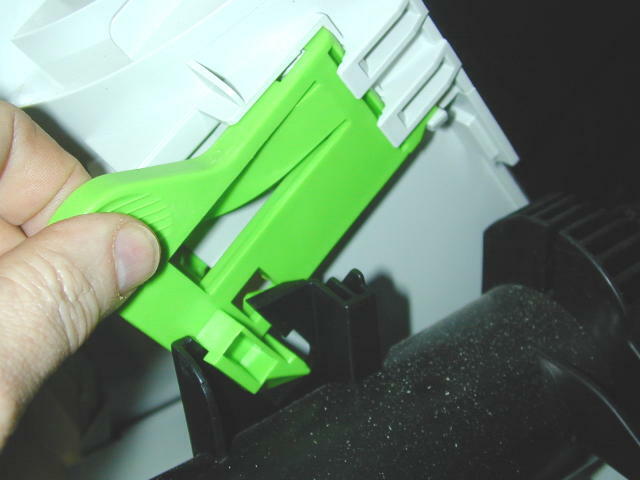 The Festool green plastic latch inside the vac body is the lock that holds the top cover assembly open. To close the cover simply push the lever to release as shown in the photos on the left and right. This is also the latch which you will depress to remove the top as described in a later paragraph. 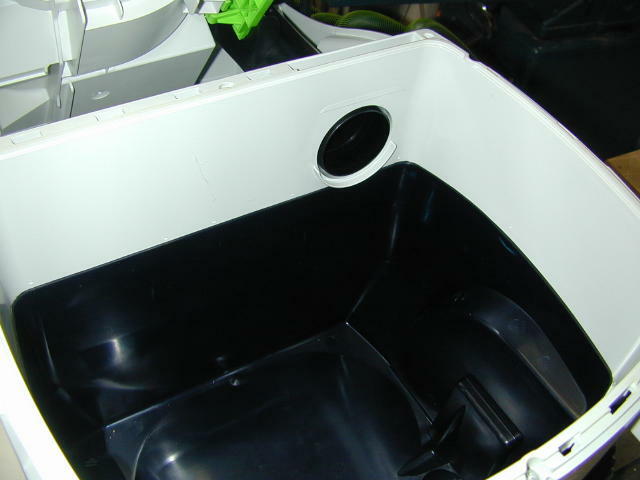 At right is the empty vacuum compartment. When sucking up dry material you should always use a bag however for wet you just change the paper main filters for a pair of sponge filters. The bags come with a plastic connector and a cap so that when you remove the full bag you can cap off the opening and not spew dust all over the place. The bag simply slides into the hole in the dirt compartment (right). 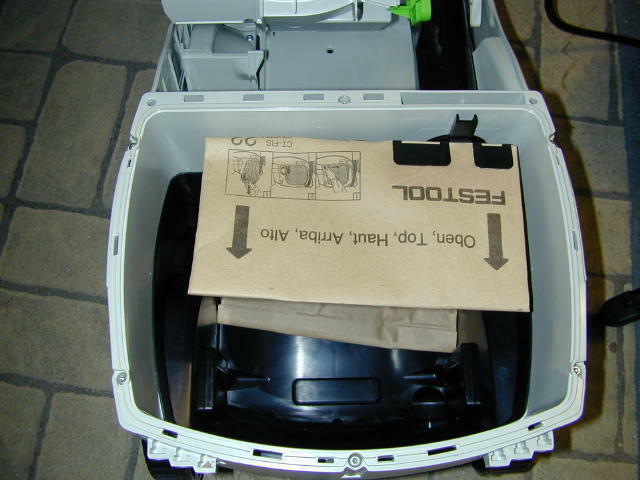 To remove the bag just slide your fingers between the bag and the vac and slowly work it out of the hole. 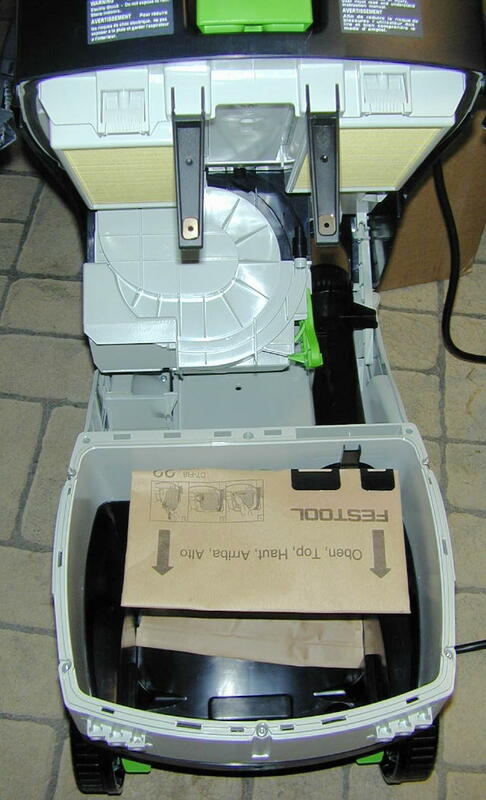 Then plug the hole with the cover before lifting the bag so as not to make a mess. The only aspect of the CT22 design I found lacking has to do with its wet operation. 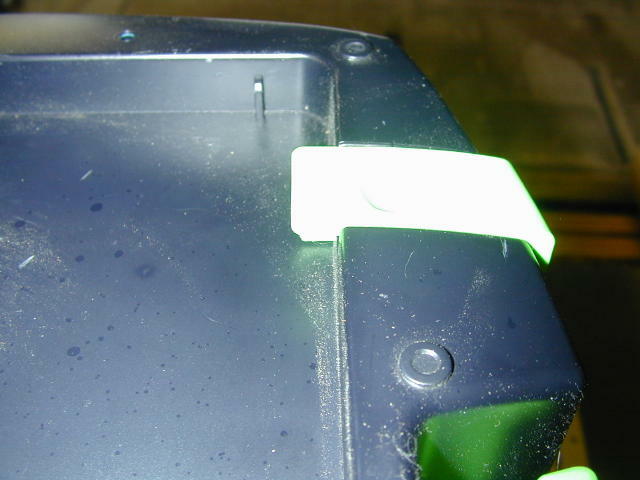 Since there is no drain in the compartment and no handles to grab on to, emptying the CT22E could be problematic. 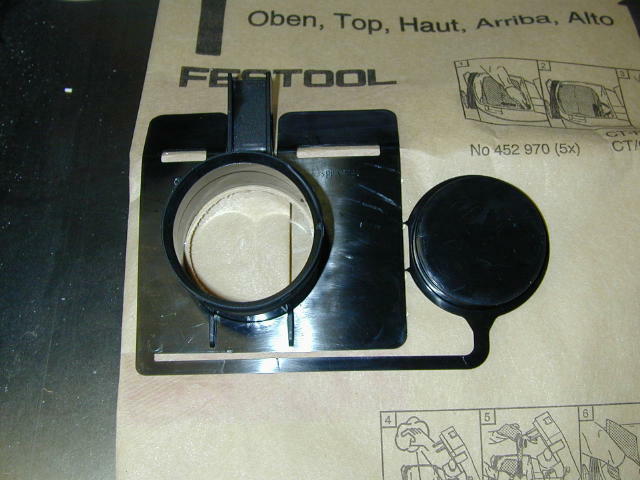 Festool does sell an accessory "Dirt Trap" with a lifting handle for use with wet and coarse dirt which should make it easy if not the easiest vac to empty. 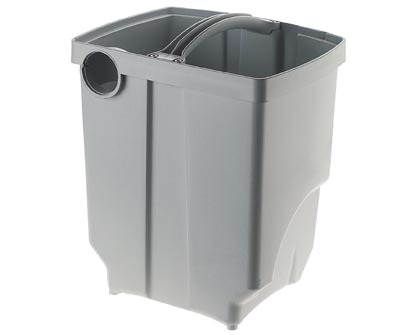 In its standard configuration, when it's time to dump the water out just open the CT22E. Once the top locks in the open position depress the green latch and continue pivoting the top until it sits perpendicular to the vac. It is supported by two hinges (circled at left). To remove the top slide the top directly forward (in the direction of the arrow I drew at left) until the hinges disengage. From there you can pick up the CT22E lower body and dump the water (right) but it's a bit cumbersome. 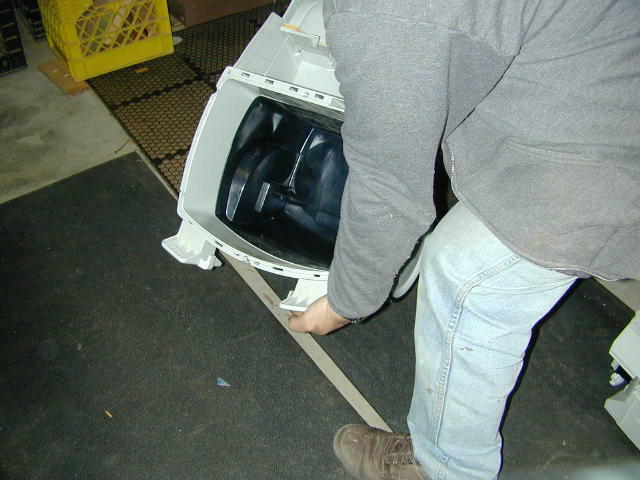 At right is a photo of the CT22E with the top cover which houses the motor assembly removed. As mentioned in the opening paragraphs the CT22E has an auto start feature. 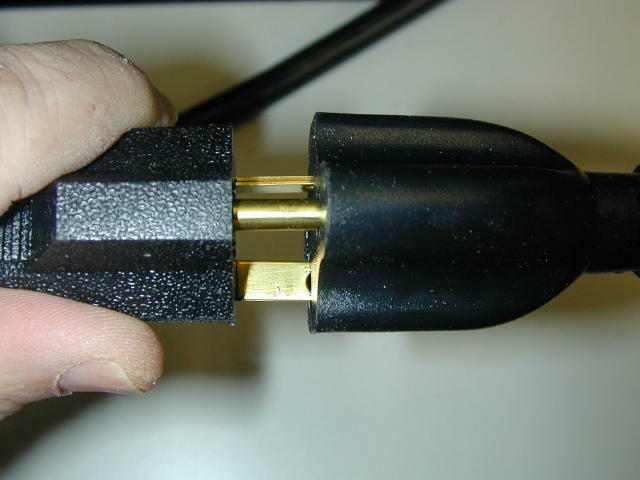 Because you might plug in a tool which draws a lot of current, the CT22E comes with a 20 amp, 27 foot long power cord. 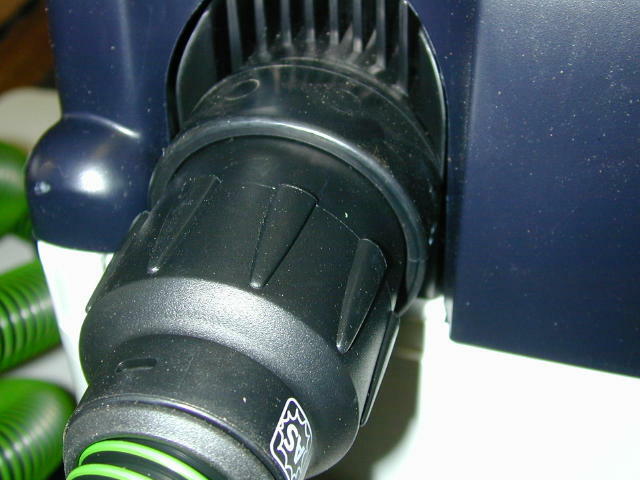 20 amp plugs are configured differently than the normal 15 amp household plug so Festool includes and adapter for that purpose (right). The controls are all on the front of the CT22E pictured at right. 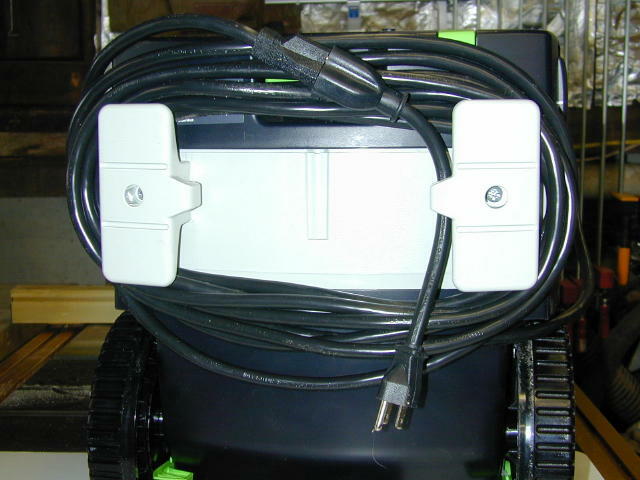 The tool outlet specifies a maximum tool wattage of 1200w or 10amps. 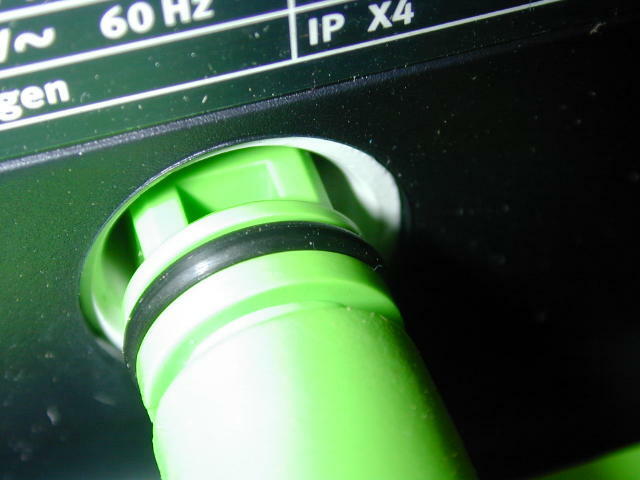 That 10 amps added to the 10 amps of a fully loaded CT22E itself bring you up to the limit of the 20 amp plug. In certain cases where full suction is not required you can turn down the variable speed of the CT22E thus reducing its power consumption (variable between 350-1200 watts) to allow for a fully loaded OF1400 or ATF 65. 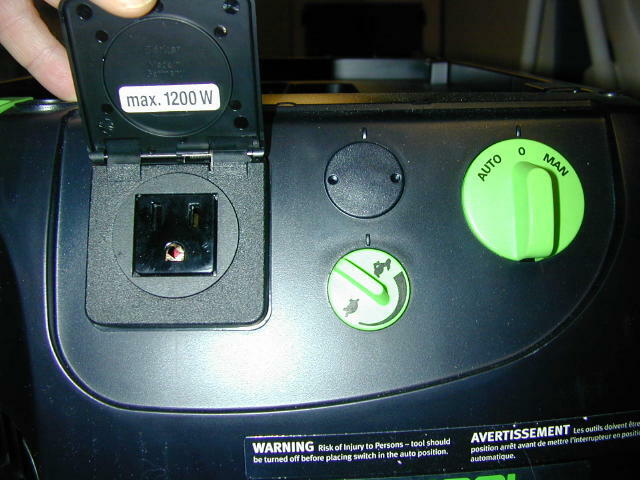 The sanders and ATF/TS55 are not rated to exceed the 1200 watts. 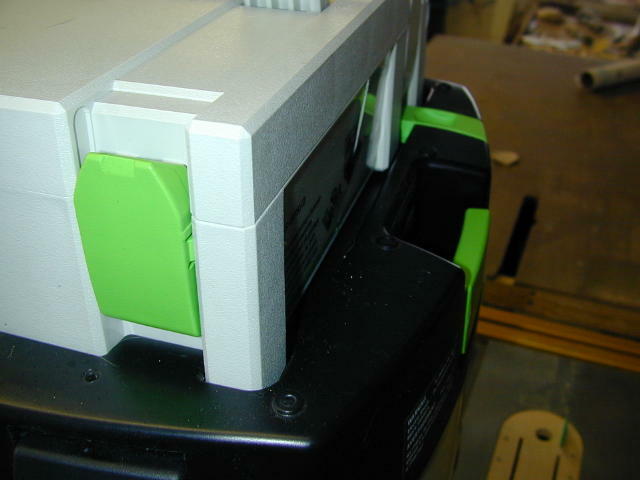 In reality, the Festool machines with MMC electronic speed control rarely consume their full rating... and then only when fully loaded and for short durations. 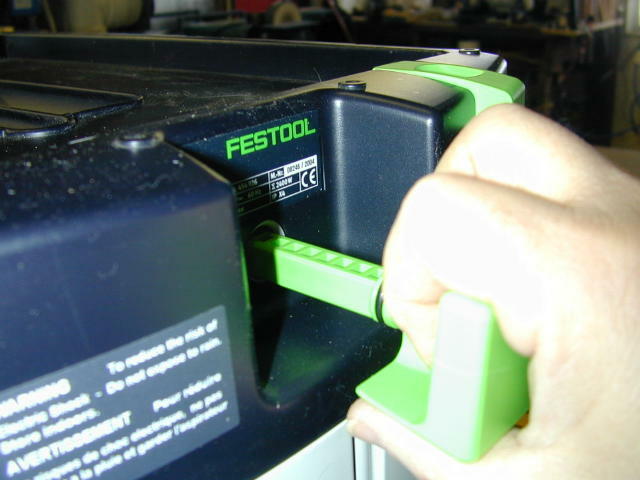 All Festool equipment currently sold in the US can be used with the CT vacuums. The knob in the middle is your stepless variable speed. 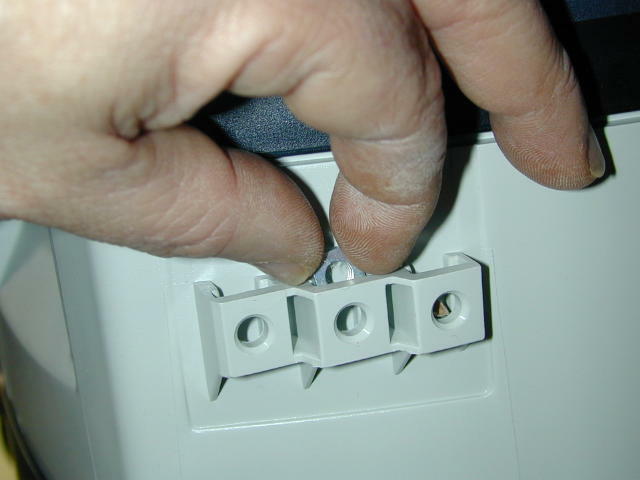 The Auto/MAN switch will turn on the CT22E when in the MAN position while when it the Auto position only the attached tool will turn the CT22E on/off. 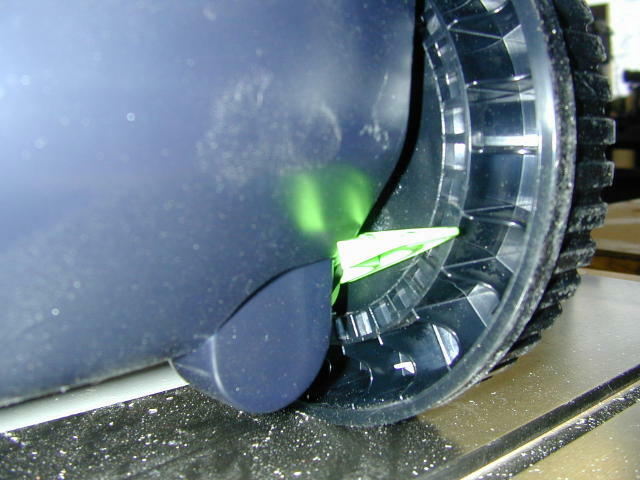 The included antistatic vacuum hose just slips into the CT22E. There are no clips. 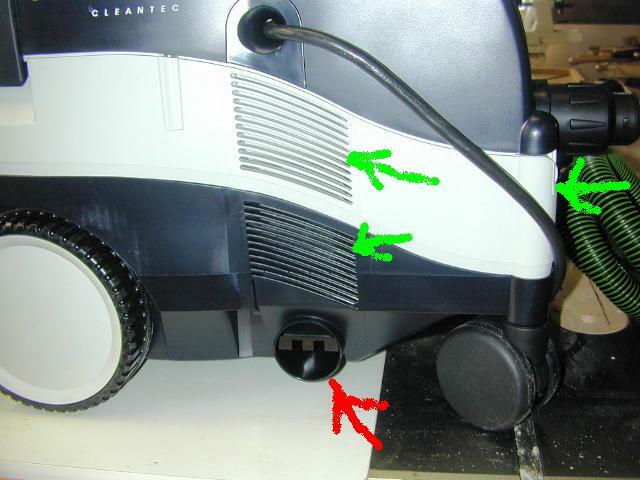 The CT22E diffuses its exhaust air through vents located on the side and front of the vacuum (green arrows) and it is very gentle and does not kick up any dust. 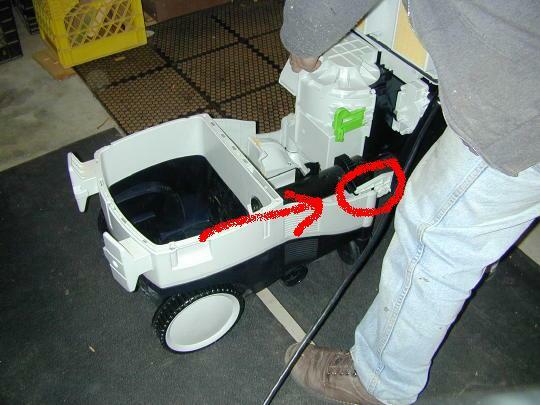 If you have a need to inflate something you can insert the hose into the normally closed output port (red arrow), but don't expect it to blow like a compressor. 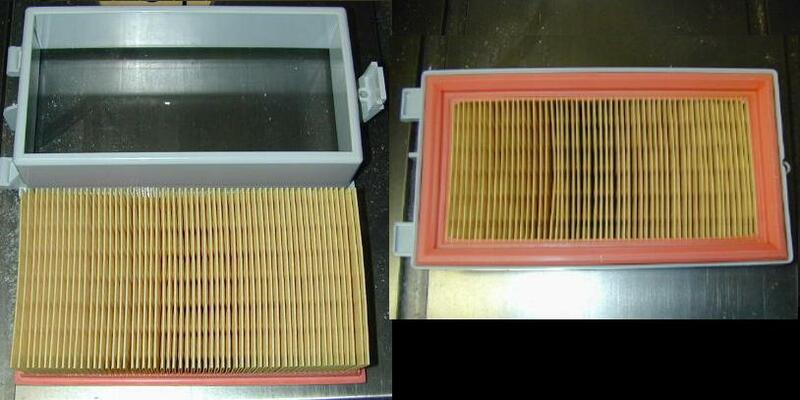 You recall that there are a pair of pleated filters in the CT22E. 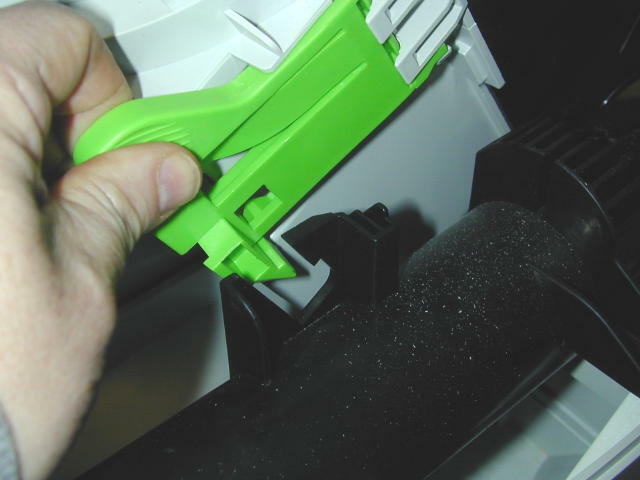 Festool has included a method for cleaning those filters without opening the vac. There is a handle on the rear of the cover which when slid out and back a few times will knock the dust out of those filters (left). 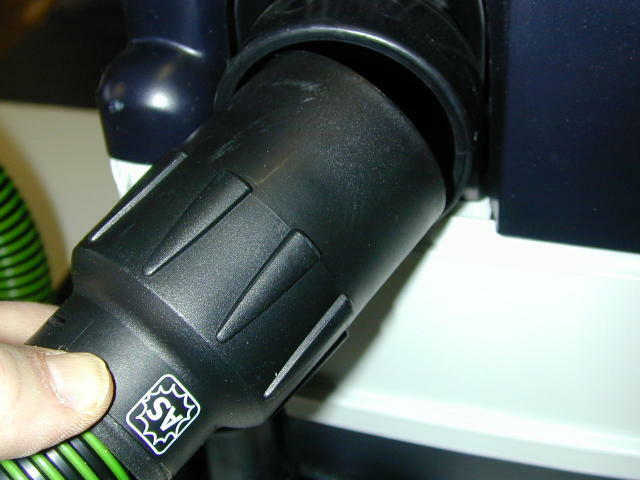 Festool's attention to detail is demonstrated in the photo at right where you see an o-ring on the shaft of that same cleaning lever to assure the CT22E maintains its seal. The last feature I'll mention is that the CT22E has wheel locks on its two rear wheels. I've found them to be quite handy when vacuuming the shop floor and I want the CT22E to stay where I put it. With the wheels unlocked the CT22E moves freely around and because of its design does not tip over when you pull it with the hose like many of the top heavy round vacs do. Copyright © 2006, Bill Esposito.